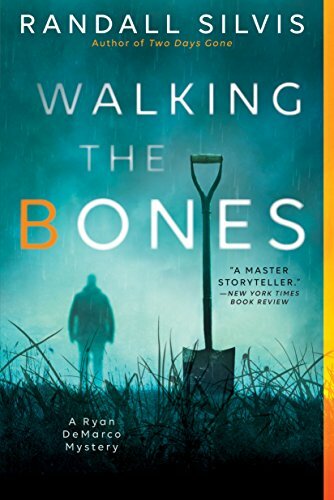 Randall Silvis, in his new book, Walking the Bones, has placed his protagonist, Sgt. Ryan DeMarco, in the precarious position of questioning his own mental stability. DeMarco is fighting several personal devils at one time: the death of his young son in an automobile accident; the death of his friend and coworker, Thomas Huston; recurring nightmares of his abusive father; and the collapse of his marriage. Add to that the uncertainty of his current relationship with his colleague, Jayme Matson, and DeMarco is, indeed, in a state of confusion. He recognizes that his mind is in a bad place, and determines that the best way to regain his self-control is to retire, but his boss and Jayme will have none of that. They convince him to use accrued sick time to give himself time to think through these events. Jayme informs him that she is also taking time to help him figure out where he’s at and where he’s going. As DeMarco and Jayme prepare for their hiatus, Jayme learns that her grandmother has died, and they embark on a trip to the small town of Aberdeen, Kentucky. And here is where the adventure begins. Nothing happens in a small town that all of the inhabitants aren’t aware of, and DeMarco and Jayme soon find themselves embroiled in the middle of a decades old unsolved mystery of the murders of seven young black girls. Potential perpetrators include a powerful minister of a large flock of parishioners, a wealthy dentist who is married to a disabled woman who is several decades his junior, a local handyman who gives his wife to other men, and a lowlife ex-con whose energies include abusing under age girls. Following his instincts, DeMarco seizes on every clue he can obtain and begins to put the puzzle together. The story of these murders and how DeMarco resolves them, is a good one, but feels cluttered. Silvis introduces a multitude of characters that wander through the story. Among them are Vincente, Rosemary, and Hoyle—three self-proclaimed investigators who are determined to resolve this series of murders and bring the killer to justice. They have decided who that guilty party is, and their attempts at detecting make them look like the three stooges, and one wonders if they would have been better left out of the story. In creating this tale, Silvis gives a great deal of attention to DeMarco’s life as a young boy and his relationship with an abusive father and a loving mother through flashbacks and dreams. It’s hard to determine why so much time is spent on this backstory, as it adds little to the mystery of the dead girls. Likewise, Silvis’ attempt at providing backstory to Jayme’s life offers little about her background and occurs only once. In both instances, the backstory tends to lead the reader down a series of paths that wind away from the heart of the story. The story does not feel as if it starts at the right spot, and Silvis’ hook is a prologue that is repeated further into the book. Likewise, his second chapter is confusing with regard to the situation that really places DeMarco and Jayme in the middle of the mystery in the first place. The book is divided into parts and there seems to be no reason for that other than the book is quite lengthy and perhaps Silvis felt the size of the book required such breaks. In the development of his characters, DeMarco appears to be the most three dimensional of all the characters. Given his role as the protagonist, this is good, but the remaining characters, especially the actual perpetrator, remain somewhat flat. Silvis does tie up several loose ends. Fans of Randall Silvis’ previous books may find this one enticing—certainly the concept of these murders and DeMarco’s drive to uncover the murderer is a good premise. For those readers who can get past the first few disconnected chapters, and the overplayed personal backstory of the hero, the book will be interesting and a good read.